National Bulk Equipment, Inc. (NBE) has introduced a single- station, variable container filling system for bulk filling of drums, cartons, totes, gaylords, bulk bags and other bulk container types. The NBE variable container filling system advances beyond conventional rotating fillhead designs to provide dry bulk material processing operations container- specific filling, densification, and NTEP-certified weighing. The NBE variable container filling system has a proprietary densification design integrating two densifying methods. This NBE design enables varied container types to be processed through the same fill station. The NBE design ensures precise fill volume and weigh accuracy, optimal line speed, reduced material waste, and eliminates material contamination resulting from operator hand levelling of material. 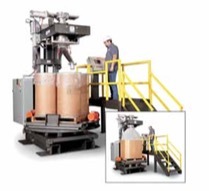 When in the multiple container mode, the NBE variable container filling system uses an automated, vibratory densifier pad to individually densify each drum on a pallet. The densifier arm and pad automatically extend from the unit to densify one drum at a time. When a drum fill/densification cycle is complete the pallet deck rotates to repeat the cycle with each drum on the pallet. This one-by-one densification eliminates the problems common with rotating fillhead designs that vibrate the entire base of the unit; these problems include drums bouncing out of the unit, and operators reaching into equipment during densification to stabilize drums. When in the single container mode, the NBE variable container filling system uses a deck-only vibratory densifier for large, single containers such as gaylords, totes, and bulk bags. The NBE design isolates 3G of vibration force to the deck of the system rather than vibrating the entire base of the unit. This isolated vibration concentrates the vibratory effect to the container enabling precise material fill volume and weigh accuracy. The isolated vibration also eliminates the damaging and annoying transfer of vibration to surrounding equipment and work areas common with conventional densifiers.